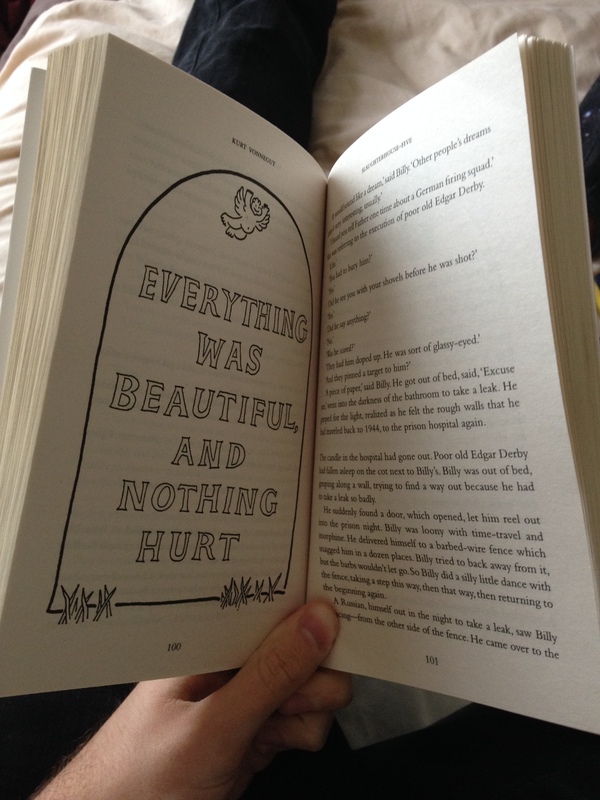 Listen: Billy Pilgrim has become unstuck in time. Slaughterhouse 5 follows the life of Billy Pilgrim, a WWII soldier who was present during the horrors of the Dresden bombing. A prisoner of war at the time, we read a rambled account of his life before, during and after this cataclysmic event. Rambled you ask? Yep. That’s because Billy Pilgrim time travels, subconsciously. This account of his life takes him from war-torn France to his eighteenth wedding anniversary, to his days in school to his enclosure at the zoo on the planet Tralfamadore, and eventually to his death. So it goes. Not in any particular order mind you. Billy Pilgrim does not experience his life on a continuous plane, and nor does the reader. How anyone else would experience their lives, as a linear progression of events and ageing as time goes on, is declared absurd. At least, this is what Billy Pilgrim learns from the Tralfamadorians who abduct him and teach him about life, time, free will and the fourth dimension. The Tralfamadorians are strange alien creatures. Their ideas on free-will and the fourth dimension hugely influence the Slaughterhouse 5’s unorthodox narrative. The events of the novel, zipping backwards and forwards from one of Billy Pilgrim’s life event to the next, is very much how the Tralfamadorians view time. They can see the 4th dimension, and are believers that everything that has happened, is happening or will happen, can’t be changed. Rather than a straight line, they see time as assembled moments which can be experienced simultaneously, memories and experiences being ‘all at once’. The Tralfamadorian in the passage above speaks to Billy on the strange fascination that humanity has with the idea of free will. For them, and by the sounds of it all other life in the universe, all events are structured beyond the control of their participants. In other words, enjoy the ride. This applies to death too. Death is unavoidable and as such there is no fear of it. The Tralfamadorian saying “So it goes” is adopted by Billy Pilgrim and the narrator throughout the book, a casual saying that highlights the nonchalant approach to death. It is not an end, rather another moment that exists at the same time as all other moments one will experience in their life. “Little Billy was terrified, because his father had said Billy was going to learn to swim by the method of sink-or-swim. His father was going to throw Billy into the deep end, and Billy was going to damn well swim. We can see why Billy Pilgrim finds it easy to believe the Tralfamadorians and refuse the notion of free will. The passage above shows that even at an early stage, Billy Pilgrim had little choice in his circumstances. He was going to learn to swim, and he had no choice in the matter. He would later be rescuing from drowning, and he had no choice in that either. Billy is slightly awkward and a very nervous individual, something which he attributes to his moving through time – he never knows which piece of his life he will have to perform next. 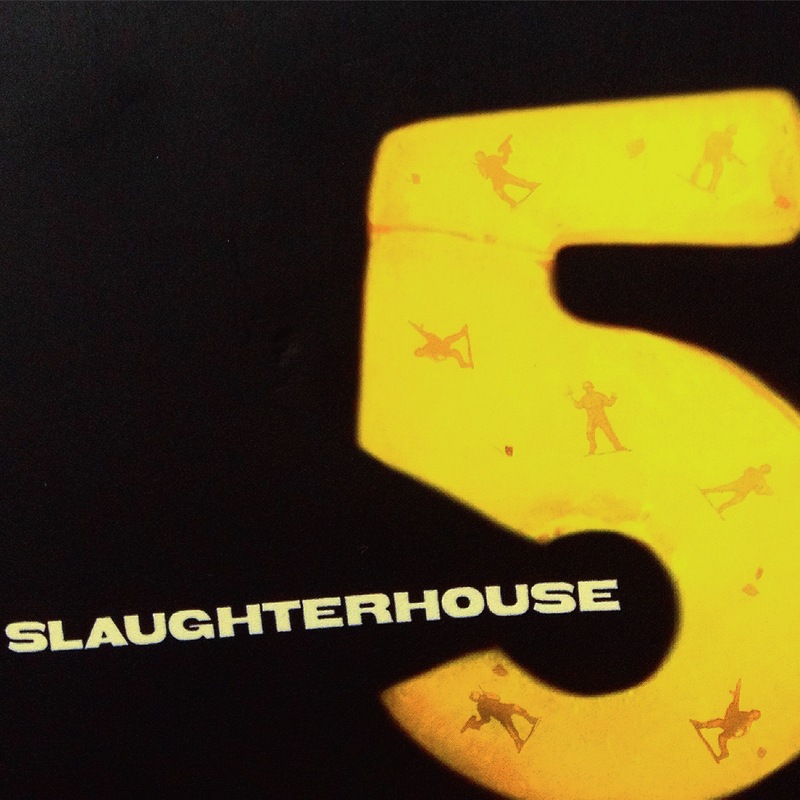 Slaughterhouse 5 is a satirical anti-war novel, or at least that’s what it might appear to be upon first glance. Vonnegut himself was present during the Dresden atrocities, which makes the book somewhat semi-autobiographical. And so it would make sense for the novel to be anti-war. Who better to write it than Vonnegut, who was present and witness the destruction first hand? The unnamed narrator of the book, who introduces the life of Billy Pilgrim, is almost certainly a version of Vonnegut himself. And several times in the novel, he is mentioned as being present. When the American soldiers are emptying their upset stomachs into the latrines, the narrator is there with them. When the prisoners of war finally arrive in the German city of Dresden, the troops are enamoured by its beauty. The narrator pipes up, describing it as ‘Oz’. These mentions keep the book rooted in reality and make its impact more meaningful and believable. After some time away from the novel (and a chance to let it sink in), I have more of an idea of what this book is meant to be. I’ve reached over for my copy of Slaughterhouse 5 more times than I can count in the last fortnight. Not to give it a proper re-read – not yet anyway – but I find myself skimming through random passages and chapters, much like Billy Pilgrim finds his mind scattered between his life’s timeline. This is a book which cannot be pinned down by genre. It is a book of Billy Pilgrim’s search for a reasoning behind human suffering. Religion and patriotism don’t really cut it, and so Billy Pilgrim (either in his mind, or for real) leaves Earth for Tralfamadore, where you can experience your good memories and you can never die. Even before birth and after death you can sense something, before being swung back into a memory from within your lifetime. An uninspiring insipid existence which sums up most of Billy Pilgrim’s life. He stumbles through it. He doesn’t take action. A passenger in his own life. He rarely makes choices. The war, his marriage, even as he grows old his daughter walks all over him. He is an observer to the mindless violence and horror, which eventually drives him (or his mind) to another planet, somewhere where he can attempt to make sense of all this. But even then, he doesn’t discover any of this for himself – the Tralfamadorians teach him all he knows. Billy manages to survive the Battle of the Bulge where stronger, fitter, better men perish. Fate? He is forced to continue through enemy lines by Roland Weary, a violent but equally inexperienced soldier with grand ideas of war and fighting and heroics. Frequently, exhausted and broken Billy tells Weary and the scouts who accompany them, “You go on. . .You guys go on without me. I’m all right.” But Weary forces him to continue. Billy, at least later on in his life, seems to acknowledge this indifference to life, and is ashamed and embarrassed as it makes his relationship with his mother unbearable. The war plays a huge part of the novel, and obviously shook Vonnegut. War is described using particular experiences. Very little heroics, very few soldiers wanting to be where they are. And for the majority of the book, the soldiers we experienced are prisoners of war. They have no choice, no freedom, no control over their situations. War is not romanticised here, and characters in the book that do look upon it favourably, e.g. Roland Weary or Bertram Copeland Rumfoord, who tries to reason with Billy in a hospital ward they at one time share that Dresden was justified, are cast by Vonnegut as the villains of the piece. The wife of the narrator’s war comrade is furious to find out he is to be writing a book on the war and his experiences, as she thinks he will glamorise war. He does not – Slaughterhouse 5 reinforces the pointlessness of war, and the narrator even promises that he will call the book ‘The Children’s Crusade’, which is actually the subtitle to the book itself. Vonnegut describes some moments that typify war and suffering, and certainly does not romanticise or glorify war in any way. In the aftermath of the firebombing that ravaged Dresden, Billy observes the calculated ruthlessness that has murdered a large proportion of a city. When the bombs dropped, no thought was given to who the targets would be – soldiers, women, children…or ironically, American prisoners of war. One of the most noble, senior officers, Edgar Derby, is reduced to tears after tasting syrup; so desperately starving he had been. To see someone that Billy Pilgrim looked up to, as a real gentleman and good guy, dehumanised as a victim of sufferable war, is significant. “A middle-aged man and wife were crooning to the horses. They were noticing what the Americans had not noticed – that the horses’ mouths were bleeding, gashed by the bits, that the horses’ hooves were broken, so that every step meant agony, that the horses were insane with thirst. . . This is also extremely interesting albeit sad and tragic. Billy cries for the only time during the war. Why? Because of the condition of the horses? The horses are similar to Billy, and the rest of his imprisoned soliders. They are following orders, with no way of making sense of the destruction that surrounds them. Like Billy, they are innocent, but continue marching on, following orders that they can’t possibly understand. So it becomes reasonable to assume that Billy Pilgrim, understandably, is suffering from post traumatic stress disorder as a result of what he has experienced in the war. Suddenly a lot of the strange observations and memories make more sense. Those terribly written but fantastical stories written by Kilmore Trout – a way of escaping reality, or to lose himself within the absurd plots. When considering Billy’s nightmares, his kicking and screaming in his sleep while on the boxcart in Germany (resulting in the other soldiers unwilling to sleep next to him), easily startled and the flashbacks – not becoming unstuck in time, but relieving moments from the war that he cannot forget. The prime example of these flashbacks is at his eighteenth wedding anniversary. A barbershop quartet performs for Billy and his fat wife, Valencia. A latent memory from Dresden is triggered, and the effect it has on Billy speaks for itself. The whole space travel experience on Tralfamadore is now put into perspective. A way for Billy to deal with the horrors he has seen and can’t explain. An attempt to make sense of the senselessness of war. If we have no free will, and our actions are pre-determined, then it is hopeless attempting to explain and prevent such appalling events such as war and suffering. And so Billy Pilgrim creating a world for himself, where there is no free will, is his way of attempting to comfort himself, his existence and his peace of mind. This was my first Vonnegut experience, and I loved every word. The genre of Kurt Vonnegut, from what I’ve heard, is primarily a blend of satire and science-fiction. But I don’t recognise Slaughterhouse 5 as a science fiction book. Sure, Billy Pilgrim’s alien abduction and time spend on Tralfamadore comes straight from the world of science-fiction, and Kilmore Trout is introduced along with many of his bizarre fantasy books as a science-fiction writer. But these are fronts. Methods of escape used by the characters. Billy and his mental ward-mate Rosewater read these works of science fiction by a rather poor writer in Trout to escape a reality that they can, or no longer want to face. Billy escapes to Tralfamadore to find explanations to life, suffering, war and the atrocities he witnessed in Dresden. “Poo-tee-weet?” is the final phrase of the novel. Billy observes the charred landscape of a ruined Dresden, met with silence but for the song of birds. The question mark indicates this bird is asking a question, but as we cannot understand it and it makes no sense to us, we have no way of answering. I think Billy Pilgrim (and Kurt Vonnegut) realise that the question of war, and the atrocities come with it, also pose questions that we simply cannot answer. In which case, “Poo-tee-weet?” is as intelligible a thing to say at the end of a massacre as any spoken words we could actually understand when trying to describe the indescribable. It’s a strange piece of work and anything but coherent. It has dark humour, a meandering plot; it’s beautiful and emotional as you might expect from someone who was present at the time. Make sure you read it before you ‘die’. So it goes. This sounds like a fascinating book! I will have to pick it up.